We are committed to obtaining the best possible results for our clients. The Law Offices of Sheldon Leibenstern is committed to obtaining results for our clients. We have a reputation for success in all types of personal injury cases throughout New York and other locations. 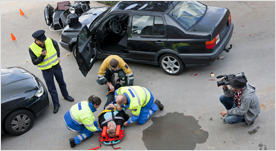 Personal injury is a broad term, which encompasses a wide variety of accidents. Our years of experience enables us to provide superior representation for people injured, regardless of their circumstances. We understand the devastating impact an accident can have on your life. We have the experience, skills and resources required to battle negligent individuals and corporations so that you receive a satisfying award. Several issues need to be resolved after an accident. In many situations, you will need medical attention, often from a specialist and it can take months or years to fully recover, if at all. Living expenses and medical bills can add up quickly and cripple your finances. We can often assist you with these issues. With time limitations governing claims and our staff needing to conduct an investigation as soon as possible, it is crucial that you act quickly. We can help you get through this time consuming process and ensure that all legal deadlines are met. Was the accident reported? If so, to whom? If you were in an automobile accident, do not leave the scene until local police arrive. If you are injured, you should seek medical attention as soon as possible. When being examined by a doctor or any health care provider you must state or describe your injuries to them. Keep in mind that often after an accident your adrenaline is flowing. Many times the body releases bursts of adrenaline immediately after an accident and the victim of the accident may not realize the extent of his or her injuries. Therefore, you should be examined by a competent physician who can determine whether or not you have sustained bodily injuries as a result of the accident. To protect your rights, you should call The Law Offices of Sheldon Leibenstern at (212) 366-6300 or email us anytime, 24/7. If necessary, our office will immediately dispatch an investigator and/or engineer and/or photographer to the scene of the accident to properly ascertain the cause of the accident before significant changes occur.